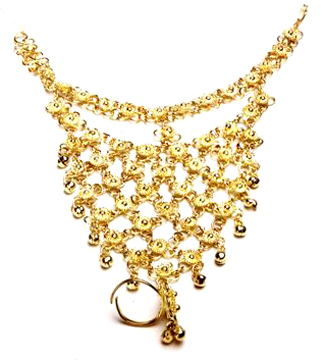 Shine like a Bollywood Star with this Indian made hand Jewelry. 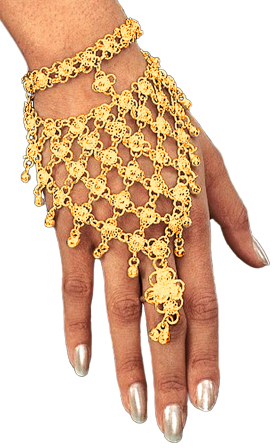 Shine like a Bollywood Star with this high-quality metal hand jewelry. An excellent addition to many costumes, including belly dance, tribal fusion, Gothic, Mardi Gras and more! One size; adjustable. Wrist measures 7.5 inches end to end; Wrist to ring measures 5.5 inches. Made in India. Exactly as described, beautiful merchandise! Thanks! Q: You state that this hand bracelet measures 8 inches in total, from top to bottom. Does it come in 5 inches in total, from top to bottom? A: Hi Annette, Thank you for your question. This bracelet ia available in only one size and is adjustable. The wrist measures 7.5 inches end to end and the wrist to ring measures 5.5 inches. I hope this helps. Q: Does this item come in silver? Thank you for your question. Yes, this beautiful slave bracelet is available in silver. It is item #1163. I hope this helps. Q: Do you get 2 or just 1? A: Hi Caroline, Thank you for your question. These beautiful bracelets are sold individually, so you will receive one. I hope this helps.